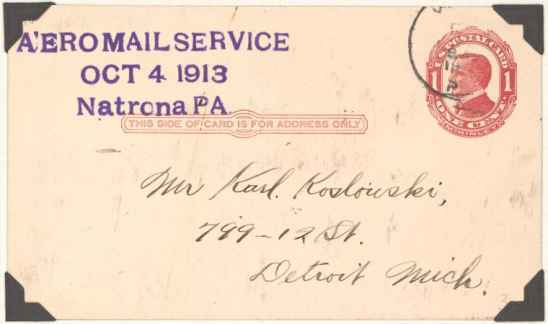 Benjamin K. Miller collection of United States stamps > October 4, 1913; Natrona, Pa.
experimental aeroplane mail service. Aviators John Kowalski and Theodore Stockman. via email from Michael H. Kane, 1-31-06 I fell into something that might interest you. Did you ever hear of a John Kowalski from Pittsburgh? He is supposed to have made the first aeroplane flight in a Pittsburgh built aeroplane on 10/9/1910. Editor's Note: I thank Mike for alerting us to this pioneer aviator. Unfortunately, I have never heard of him and my search of the net using Google was not successful. Hopefully, now that his name is on the net, somebody will find it and will contact us with more information. Gary Rogers, a historian in Verona, Pn. area has some history on John Kowalsky (also shown as John Kowalski, on some records).John was brother of my great grandfather, Frank Kowalsky. I have some information on him posted on Ancestry.com. I will send you an invitation to view the info on Ancestry, if you wish. He was an inventor, and made many inventions,it is said his Motor Boat was banned from the Allegheny River, at the time because it went too fast. he built at least 3 planes,a "Steam Duck", patented a hand crank for a drill, and many other items. ONLINE RESOURCES If you search for "John Kowalski" +1910, using the Google search engine, (9-22-08), you will find one, very important link. I tried his name with several other qualifiers with no relevant results. John Kowalski, marine engine maker, recorded the first flight of an airplane built in Pittsburgh when he accidentally took off in a four-cylinder plane he had devised." You can access the site by clicking on the title. ONLINE RESOURCES If you search for "Aeromail Service, using the Google search engine, (9-22-08), you will find two links. They both lead to offers of first day covers. You will find images of the covers, along with some details. I have no information on the dates of his birth or of his death.